Stop! Don’t pick up the ‘added vitamins and minerals’ water. Incorporating the humble and mighty cucumber into your regular drinking water is the best way to consume vitamins and minerals. 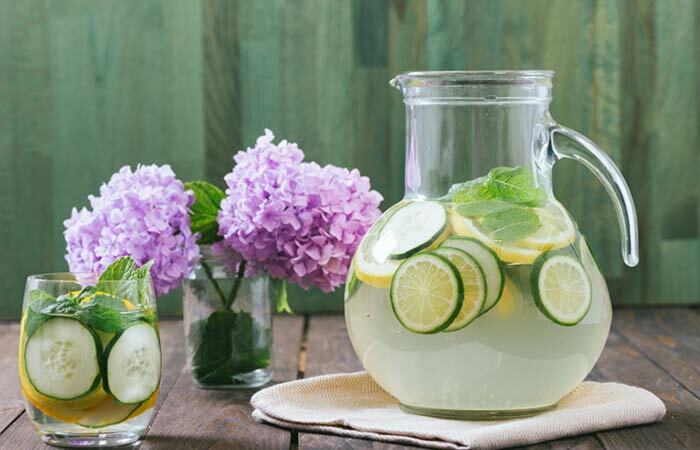 Cucumber water is a good substitute to sweetened drinks and keeps you well hydrated. Cucumbers are loaded with vitamins, minerals, dietary fiber, and phytonutrients that help maintain a healthy body and mind (1). Store this nutritious drink in an airtight jar or glass bottle. You can easily carry it with you wherever you go and sip on it throughout the day to feel fresh and active. Cucumbers are rich in flavonoids (apigenin, quercetin, kaempferol, and luleolin), triterpenes (cucurbitacin A, B, C, and D), lignans (pinoresinol, lariciresinol, and secoisolariciresinol), vitamin K, vitamin C, vitamin B1, beta-carotene, manganese, molybdenum, pantothenic acid, potassium, copper, phosphorus, and biotin (2). Flushes Out Toxins – The high water content in cucumbers helps to flush out harmful toxins from the body. When consumed regularly, it can dissolve kidney stones. Vitamins & Minerals – Drinking water that contains cucumber’s vitamins and minerals fulfills a good portion of your nutritional requirements. Fights Cancer- The cucurbitacins in cucumber block the molecules that trigger uncontrollable cell division. Lignans also help to fight estrogen-related cancers such as breast, ovary, uterus, and prostate cancer (3). Hydrates You- Sipping on cucumber water breaks the monotony of drinking regular water and keeps you hydrated all the time. Proper hydration helps to keep your cells turgid and active. Helps To Lose Weight- Cucumber is loaded with nutrients and water. It helps to curb your appetite and gives you a feeling of satiety. Hence you tend to eat less (4). Supports Digestion- A healthy digestive system keeps many health problems (indigestion, gastritis, etc.) at bay. Cucumber infused water helps to maintain good digestion due to its high dietary fiber content (5). Regulates Blood Pressure – The vitamins and minerals present in cucumber regulate and maintain normal blood pressure. Improves Brain Health – Fisetin is an anti-inflammatory flavanol found in cucumber that helps to improve brain function and memory (6). Improves Skin & Muscle Health- Silica present in cucumber helps to improve skin and muscles (7). 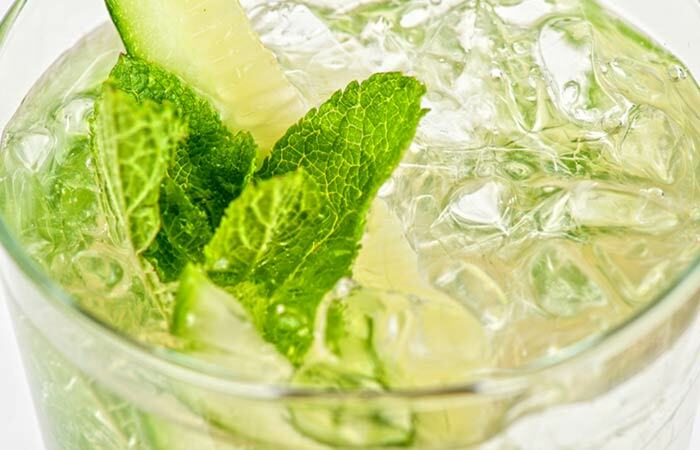 Here, we will list out 10 different cucumber water recipes that you can try. Thinly slice the cucumber and lemon and throw in a glass bottle or mason jar. Lightly crush the mint leaves and salt using a mortar and pestle. Transfer the ingredients to the glass bottle or mason jar. Pour the water in till the neck of the bottle or jar and refrigerate. Lemon helps in cutting down extra body fat by helping in mobilizing bile from the liver to the small intestine (8). Mint has an overall cooling effect. It helps in the smooth flow of bile from the liver to the small intestine, where bile helps in breaking down fats. Mint also relaxes the stomach muscles, and, of course, adds flavor (9). Thinly slice the cucumber and lime and put them in a mason jar. Cut the grapes in half and throw them in the jar. Add water till the neck and refrigerate. Sprinkle a pinch of freshly ground pepper before drinking. This drink is extremely good for your skin. Grapes are great when it comes to fighting dehydration and controlling blood sugar levels. They help to regulate insulin and increase insulin sensitivity. They also help to slow down aging (10). Lime is very helpful in regulating digestion. It helps with gastritis, heartburn, and constipation. Black pepper improves digestion and is a good source of vitamin E (11). 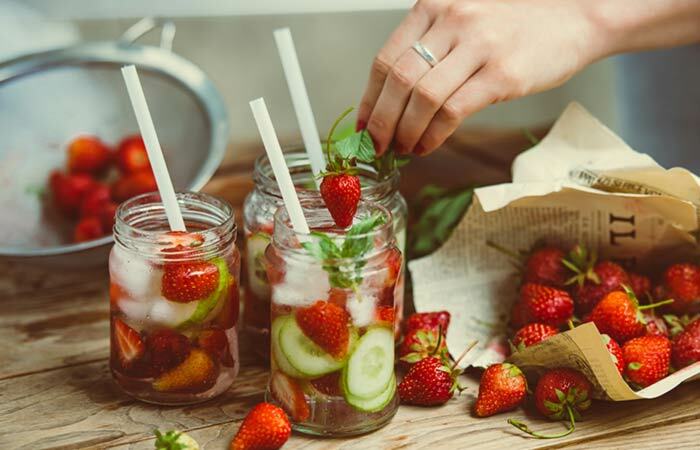 Thinly slice the cucumber and strawberries and put them in a mason jar. Take a handful of rosemary and mint leaves and a pinch of salt and gently crush them with the help of a mortar and pestle. Transfer this mix into the jar. Pour water till the neck of the bottle and refrigerate or add ice before drinking. Strawberries are rich in vitamin C, manganese, and fiber. This red and luscious fruit has antioxidant and anti-inflammatory properties. It also helps in regulating blood sugar levels (12). Mint helps in the smooth flow of bile from the liver to the small intestine, where bile helps in breaking down fats. Mint also relaxes the stomach muscles, and, of course, adds flavor (13). Rosemary is a great source of vitamin A, B6, calcium, and potassium. It improves memory and blood circulation (14). 1. Slice the apple into 1/4 inch wedges and throw in a mason jar. 2. Thinly slice the cucumber and add to the mason jar. 3. Add honey and a pinch of freshly ground black pepper. 4. Add water till the neck of the jar. 5. Finally, add the cinnamon stick and refrigerate overnight. Apples provide antioxidants, reduce cardiovascular disease risk, fight cancer, and regulate blood-sugar levels (15). Black pepper improves digestion and is a good source of vitamin E (16). Honey contains a myriad of vitamins and minerals such as calcium, copper, potassium, magnesium, manganese, and zinc. It helps in metabolizing cholesterol and fatty acids. Honey has a good glycemic index and promotes better digestion (17). Cinnamon has antioxidant, anti-clotting, and anti-microbial properties. It also controls blood sugar levels, improves brain function, protects against heart disease, and has a warming effect on the body (18). Thinly slice the cucumber and throw it in a mason jar. Take 2-3 tablespoon of cumin seeds and roast in a flat-surfaced pan until they are brown. Grind the roasted cumin seeds using a mortar and pestle and store in a small glass jar. Roughly chop the lemon leaves and throw into the mason jar. Add 1 teaspoon of the roasted cumin powder. Finally, pour the tender coconut water into the jar. Stir well and let the water be infused with all the goodness of the ingredients for about 30 minutes. Tender coconut water comprises a wide range of vitamins, minerals, electrolytes, amino acids, cytokines, enzymes, and phytohormones. It also has anti-aging and anti-cancer properties. Coconut water is very useful for people suffering from diarrhea. Tender coconut water aids in digestion and is a powerful antioxidant (19). Cumin seeds have a high iron content, which is very important for menstruating women. Cumin seeds also aid digestion and help fight cancer (20). Lemon leaf is great for those who suffer from insomnia, anxiety, asthma, and migraine. It also acts as a sedative. 1. 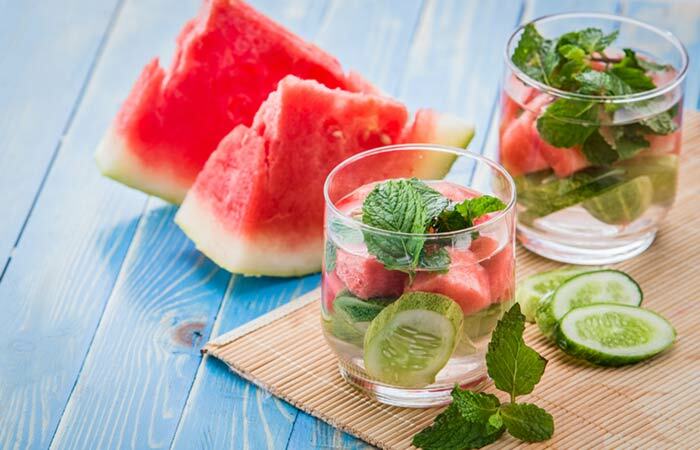 Cut the watermelon into medium sized cubes and throw them into a mason jar. 2. Slice the cucumber and lemon and add to the jar. 3. Roughly chop the mint leaves. 4. Pour water till the neck of the jar. 5. Add a pinch of salt and freshly ground black pepper. 6. Finally, add the mint leaves and stir well. 7. Refrigerate for at least 30 minutes. Store the remaining water. Citrulline in watermelon (or cucumber) helps the kidneys to flush out ammonia, which is very toxic for our body (21). Lemon helps in cutting down the extra body fat by helping in mobilizing bile from the liver to the small intestine (22). Mint has an overall cooling effect. It helps in the smooth flow of bile from the liver to the small intestine, where bile helps in breaking down the fats. Mint also relaxes the stomach muscles, and, of course, adds flavor (23). Black pepper improves digestion and is a good source of vitamin E (24). 1. Thinly slice the cucumber, orange, grapefruit, lemon, bergamot and tangerine and throw in a mason jar. 2. Roughly chop the ginger and few mint leaves and add to the ingredients in the jar. 3. Add a pinch of salt and freshly ground black pepper. 4. Finally, pour water till the neck of the mason jar. 5. Let the water soak up all the goodness overnight. 6. Add ice while drinking. Oranges are full of vitamin C and fiber. This makes them an excellent source of antioxidants. Oranges also lower blood cholesterol levels, prevent kidney stone formation, reduce the risk of ulcers, stomach, and lung cancer, and protect against rheumatoid arthritis and cardiovascular diseases (25). 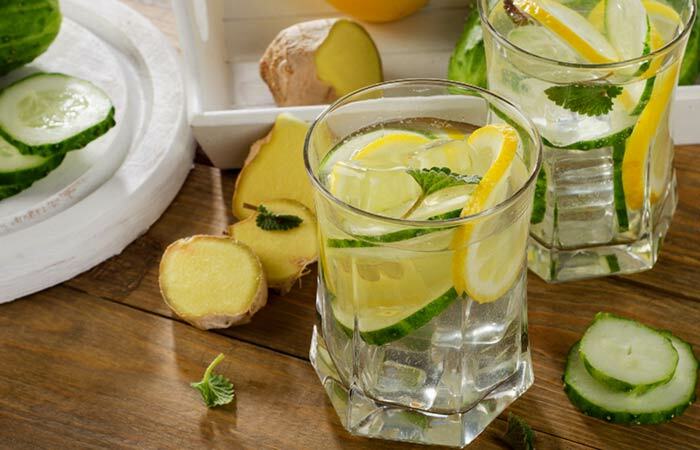 Lemon helps in cutting down extra body fat by helping in mobilizing bile from the liver to the small intestine (26). Grapefruit is rich in vitamin C and lycopene (an anticancer agent). It lowers cholesterol, has antioxidant properties, and prevents the formation of kidney stones. It has been recently found that grapefruit contains Naringenin, a flavonoid that helps in DNA repair (27). Bergamot protects from bacterial infection, is an excellent sedative, calms the nerves, and also helps in digestion (28). Tangerines help in the synthesis of collagen, and protect from neuro-degenerative diseases, cancer, cold, and arthritis (29). Ginger is used in many food recipes and is a good source of antioxidants. It has anti-inflammatory properties and soothes the gastrointestinal tract (30). Black pepper improves digestion and is a good source of vitamin E (31). 1. Thinly slice the cucumber and throw in a mason jar. 2. Add the orange zest and cinnamon stick. 3. Bring 1 cup of water to a boil and pour in a cup. 4. Dip the green/black tea bag and let it soak for about 3 minutes. 5. Add the tea water into the jar. 6. Finally, fill the jar with water. 7. Give it a stir and refrigerate overnight. Tea is rich in antioxidants, reduces the risk of heart attack and stroke, strengthens your bones, boosts the immune system, and helps to fight cancer (32). Orange zest prevents lung or respiratory disorders, helps to sleep better, relieves stress and prevents bacterial infection. Cinnamon has antioxidant, anti-clotting, and anti-microbial properties. It also controls the blood sugar levels, improves brain function, protects against heart disease, and has a warming effect on the body (33). 1. Deseed the lychees and throw into a mason jar. 2. Thinly slice the cucumber and add to the lychees in the jar. 3. Roughly chop the mint leaves and throw in the jar. 5. Finally, add a pinch of nutmeg powder and stir well. Lychee helps in boosting metabolic rate, protects against heart disease and stroke, improves blood circulation, and helps in the production of red blood cells (34). Mint has an overall cooling effect. It helps in the smooth flow of bile from the liver to the small intestine, where bile helps in breaking down fats. Mint also relaxes the stomach muscles, and, of course, adds flavor (35). Nutmeg is extremely helpful in improving digestion, improving cognitive function, fighting leukemia and skin infections, relieving pain and improving sleep (36). 1. Slice the cucumber and throw into a mason jar. 2. Add the cranberries to the jar. 3. Gently grind the black peppercorn and tulsi leaves using a mortar and pestle. 4. Add this mixture to the jar. 5. Finally, add water up to the neck of the jar. Cranberry contains proanthocyanidin antioxidants and has antibacterial and anti-inflammatory properties. Cranberry juice is recommended for women suffering from UTI and tooth decay (37). Tulsi is used as an herbal medicine for curing respiratory disorders and heart diseases. It is also a good stress reliever (38). Pepper improves digestion and is a good source of vitamin E (39). 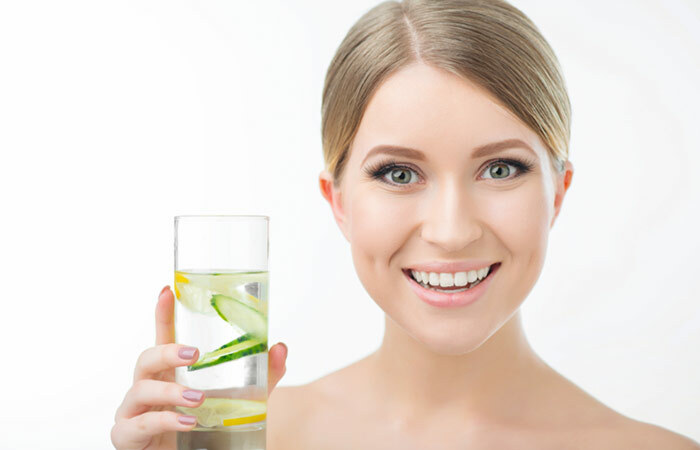 It would be great to hear how cucumber water has helped to improve your health. 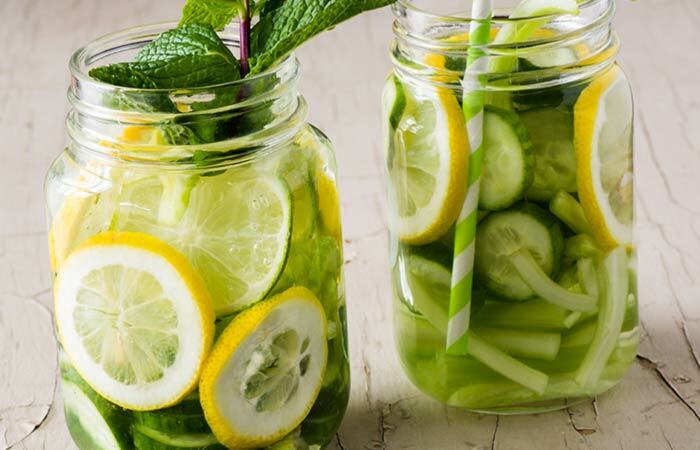 Do share your cucumber water recipe with us, if this is already your favorite drink! Write to us by commenting in the box below.